The first big story arc comes to a conclusion in Aquaman 6, by Abnett, Walker and Hennessey, as the maritime hero has to face off against Superman. To a degree, some of this arc has felt a bit like filler. The previous issue was essentially one long chase/battle scene, with little significant that changed between its first and last pages. This issue climaxes the fight, showing Aquaman to be Superman’s equal in strength, surprisingly. But that’s the kind of thing one will find in Aquaman’s own book, I suppose, and not likely anywhere else. Aquaman and Superman do discuss the increasingly dangerous situation, with the armies of the US and Atlantis getting ready to battle themselves, as the heroes fight. The discussion is quite good, with Aquaman expressing his feelings of not really being a part of the Justice League, dividing the group into two triads: Superman, Batman and Wonder Woman, and Flash, Green Lantern and Cyborg. This leaves him as the outsider. It’s an interesting take on the make-up of the League, and one that wouldn’t really have been possible when the Martian Manhunter was part of the line-up, even though Aquaman’s feelings of not quite fitting in have been established in the past, most clearly in JLA Year One. 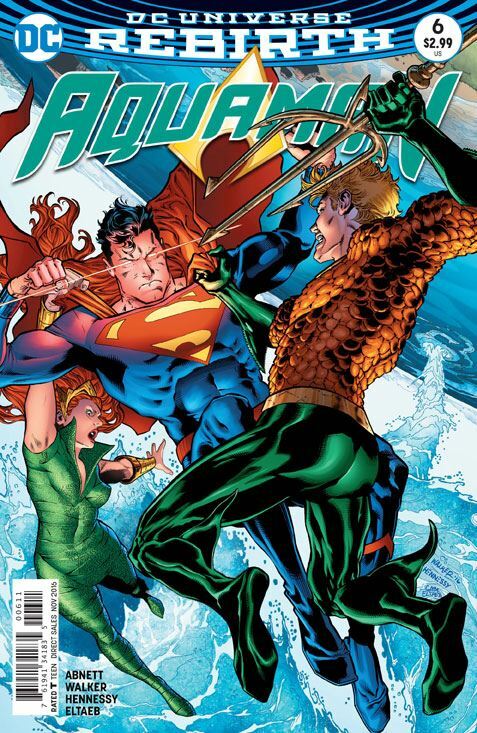 Mera joins the fray as Aquaman and Superman battle, but is not used as well as she might be. Her control over water gives her an ability to attack Superman in a way even he would be vulnerable to. The water that makes up his body is not invulnerable, after all. But as usual, Mera’s powers get overlooked. It is a constant difficulty with this character, who is simply much more powerful than the writers like to acknowledge. While Aquaman and Superman reach a détente, calling off the troops preparing to back them up, and Aquaman promises to find out who was behind the attack on the ship that started this whole mess, the Black Manta subplot also reaches a conclusion. Black Manta had been being recruited by a shady criminal organization called N.E.M.O. Never one to be a follower, Manta was not pleased by the constraints this group wanted to put on his actions, and he quickly moves to take over the leadership of the group himself. I also want to mention Blackjack, another member of N.E.M.O., the woman who recruited Black Manta in the first place. While not much is done with her in this particular story, I am very glad to see the use of an Aquaman villain named Blackjack. For those who have been following my history of all the DC series, Blackjack will be familiar as the first recurring villain that Aquaman faced, way back during his run in More Fun Comics, and continuing to be a constant problem for the hero throughout his first decade of stories. Blackjack had faded into obscurity long ago, and I am glad to see this character, or at least the character’s name, resurrected. Or should I say, given a rebirth.